Model United Nations club sent a travel team of five students to UVA to compete at VAMUN XXXVIII. 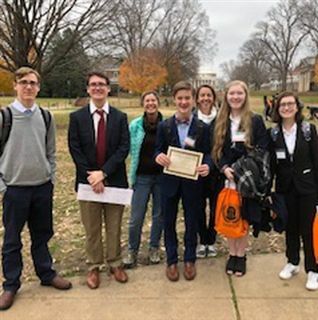 The travel team was Ben Martin, Molly Mansker, Sarah Massey, Tim Richardson, and Jamie Wenzel and Upper School History Teacher Woody Wilder as adviser. Students competed in delegations ranging from a crisis simulation of the Trojan War, to a Harry Potter Council on the Dark Lord’s ascension, to the more traditional council of the General assembly with UNICEF and O’ Neal representing Rwanda and SPECPOL with O’Neal representing Greece. The overall theme of the conferences this year was looking at scarcity -specifically water shortages. The conference opening ceremony was an inspiring talk by Charles Blaha who has been in the diplomatic field for over 20 years and is now serving as the Director of the Office of Security and Human Rights in the State Department Bureau of Democracy, Human Rights, and Labor. Mr. Blaha encouraged the students not to be arrogant. He stressed that if you are so certain of your position you are not able to be flexible. We must in this ever increasingly global world be able to listen to peoples’ opinions and especially those that hold ones that are opposite of ours. He challenge students to listen to each other and to seek out people that had different viewpoints. He quoted Colin Powell by saying we cannot let our egos get wrapped up in our positions. Students competed over three days with 1200 others students on the beautiful UVA campus. Jamie Wenzel brought home an award in General assembly SPECPOL Council with best delegate in a committee that had 48 countries represented. MUN is looking forward to our next competition which will be at American University in DC the first weekend of February.